OK, we are not talking that far back. Did you know bindery work is about the only trade promised work in the Bible? This is a short website sprung into effect by the lack of info on the web. Well some is there but you must piece it together, searching websites for hours! 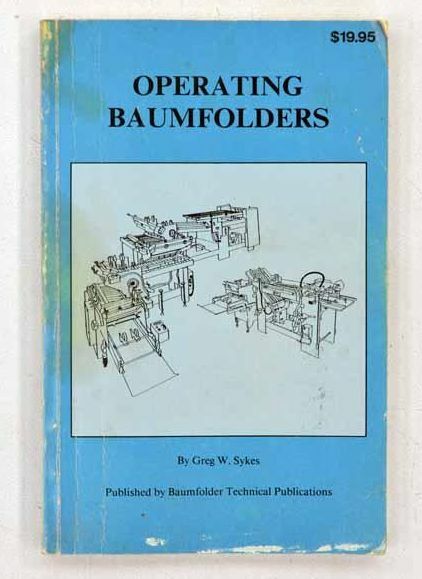 When I worked at General Bindery, learning to be a Muller stitcher operator, they would let you take home the manuals over the weekend. I copy machined them. 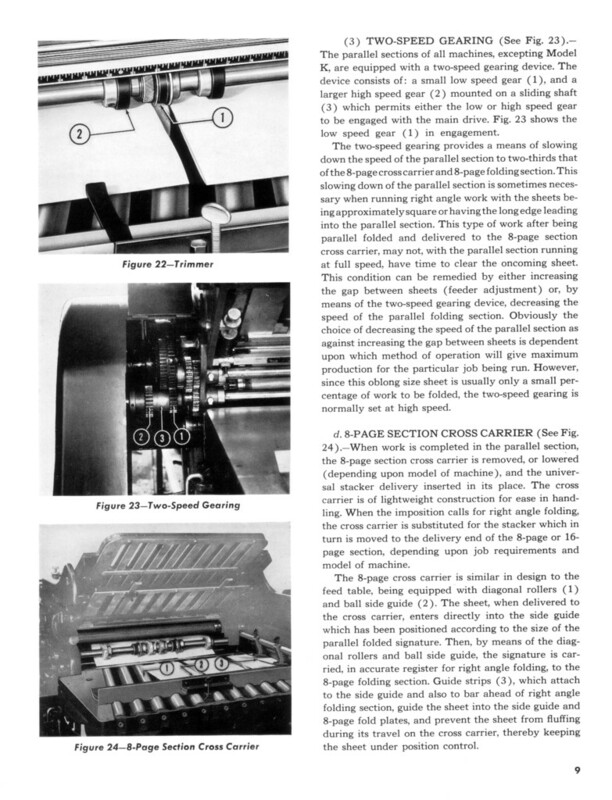 When I worked at First Choice Bindery learning to be a folder operator, they had a few Dexter folder manuals which I copy machined there in the office. Since then I have wrote companies and bought a few manuals off Ebay. 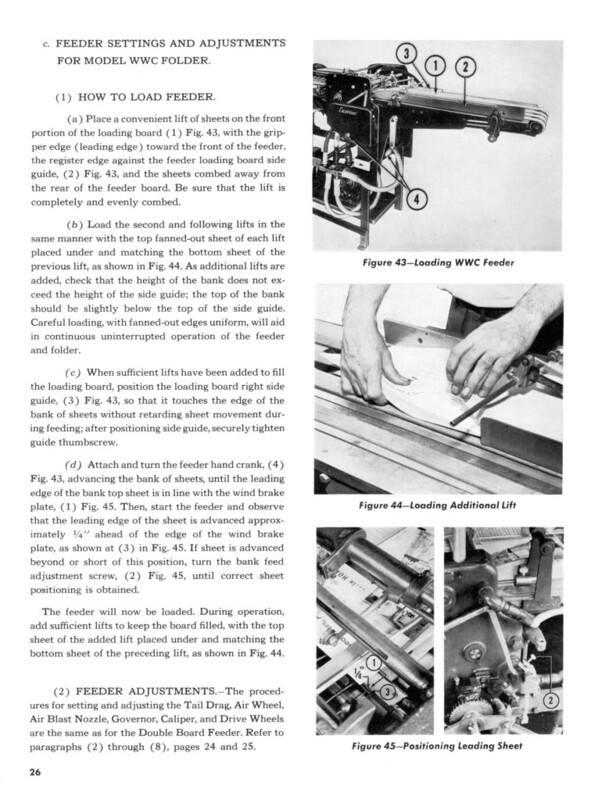 Baum Folding Company actually published a book on how to run folders. I had written Baum asking them if there ever was a book on how to run folders. I did not hear back for some time, then I got the book with a note saying, "Sorry we took so long to respond, here is a book free of charge." Years ago I lent it to someone and never saw it again. Recently I bought a used copy online so now I have it again! I have always sort of wondered about the Dexter Folder Company so that is half of what this website is about. A large Baum folder. The Cleveland KS folder was about the same size. The Muller saddle stitcher cover pocket is the old "rails" version. The next pocket over is a pre E6 pocket. Visit my Dexter Folder History page! 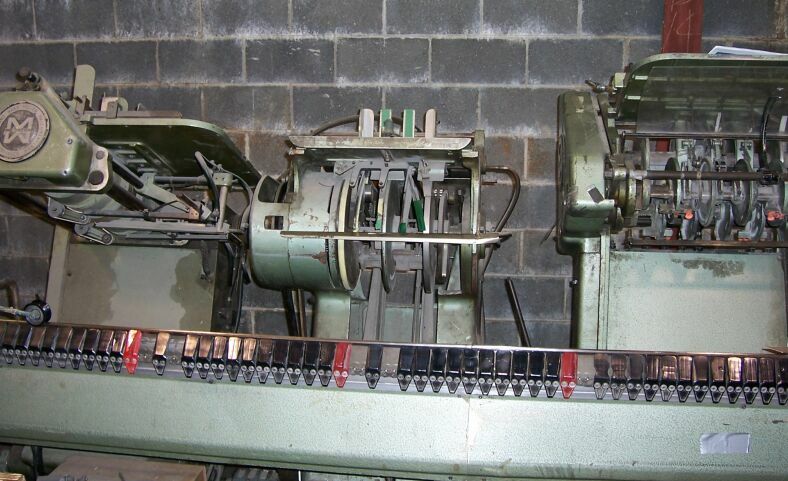 Most of the operators who know of Dexter Cleveland folders or old Baums, where you had to barber stripe tape the rollers and mechanically set the feeders, etc... and climb up steps to load the board are now retired or soon will be! If we go further back, we see that buckle folders came later after knife folders. This webpage pieces together the changing company of the Dexter Folder Company of Pearl River, NY. Visit my Sheridan Co. History page! The folder shown here has three folding units. ... The operator may remove the cross-carrier section and attach the stacker (delivery unit) in its place after any of the folding units if no further folds are required. The first folder that I know of which was made in separate sections was the Dexter Cleveland CU folder. The "CU" standing for "Cleveland Unitized." It had rollaway units. Now you could line up the sections in tandem for more parallel folds. "Dexter Announces Super Duty Folder. The new Super Duty folder has been announced by the Dexter division of MGD Graphic Systems." This was a bulky multi section folder. In recent years the folder companies have been making folders with more plates in a section which would eliminate lining up sections in tandem. They aren't needed so much if you only need to do it occasionally. 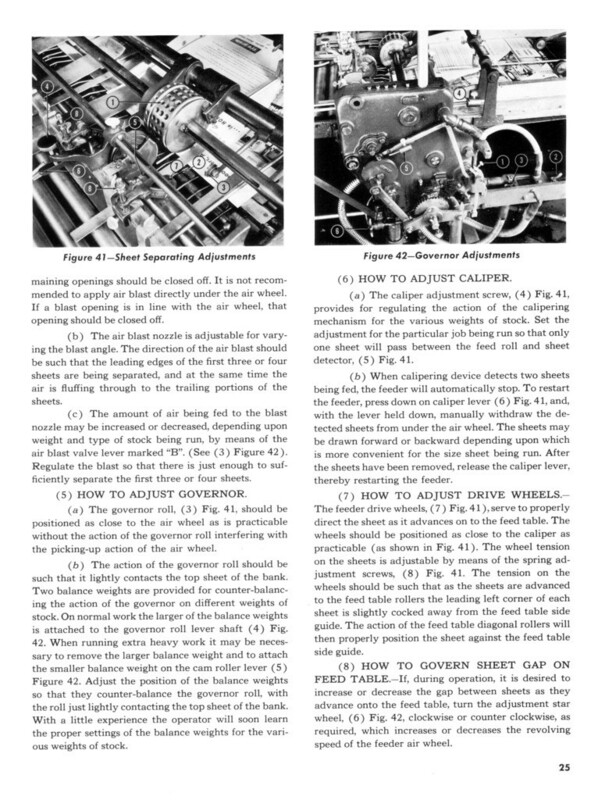 Baum was the first folder that I know of to have belts, or "tapes" I think they were called, in the parallel section instead of angled rollers. 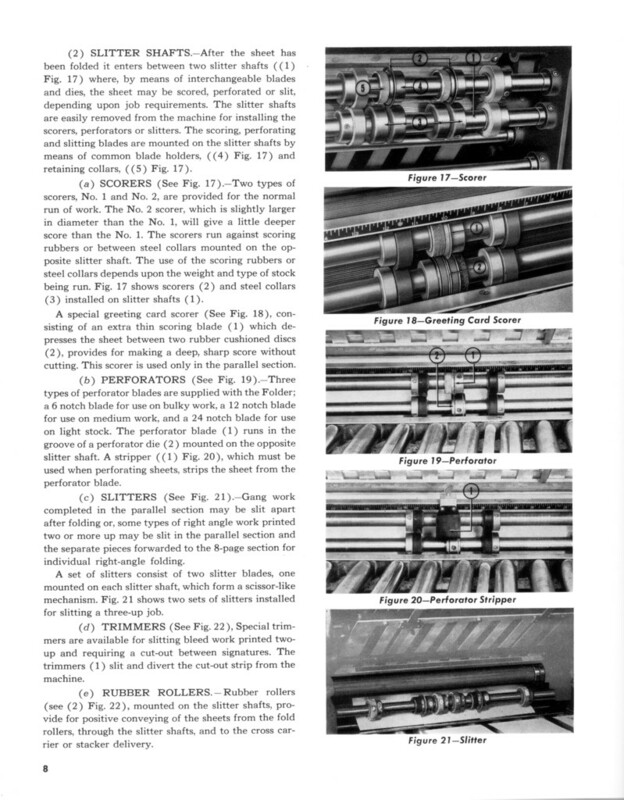 The jobs did not always register to the guide as nicely as with the rollers though. Now all the folder companies have belts in the parallel section register table. You once had to walk up a step or two on a medium to large folder. This would be an inconvenience. Today's Stahl folders have real slanted bottom feed boards so they can make where you load the board lower. Some coated stock is very slippery and you might have to fight to have it not FALL backwards. It's no fun to squat down near the floor to keep messing with the feeder. I used to grab a chair when doing a hard job! All the bindery machinery has gotten much more safer! In the old shops there would be several people missing fingers or parts of fingers. The best all around stitcher pockets were the old Muller E6 pockets. I said "all around." You could slant them forward or back for step jobs. 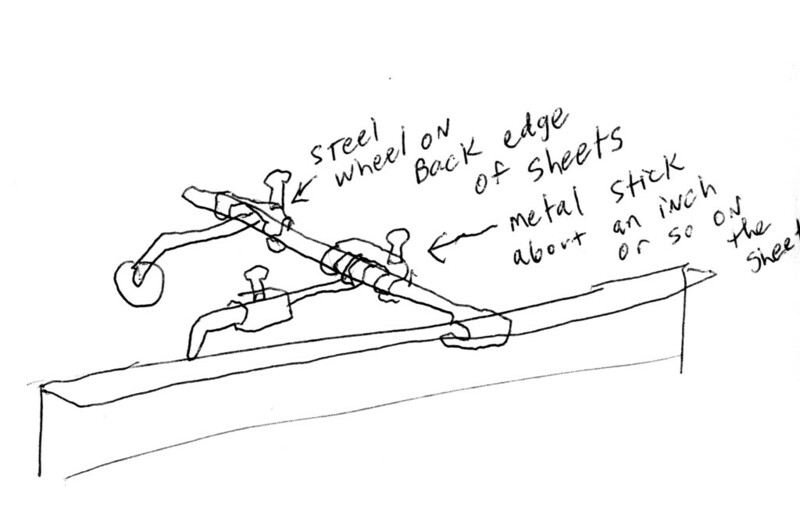 I seen one you could take the idler gear off and re-adjust the bottom "opening" drums to a different position and put metal stop brackets on to run real long forms. Of course you would have to reset it all again for normal sized signatures. That's some things for now. 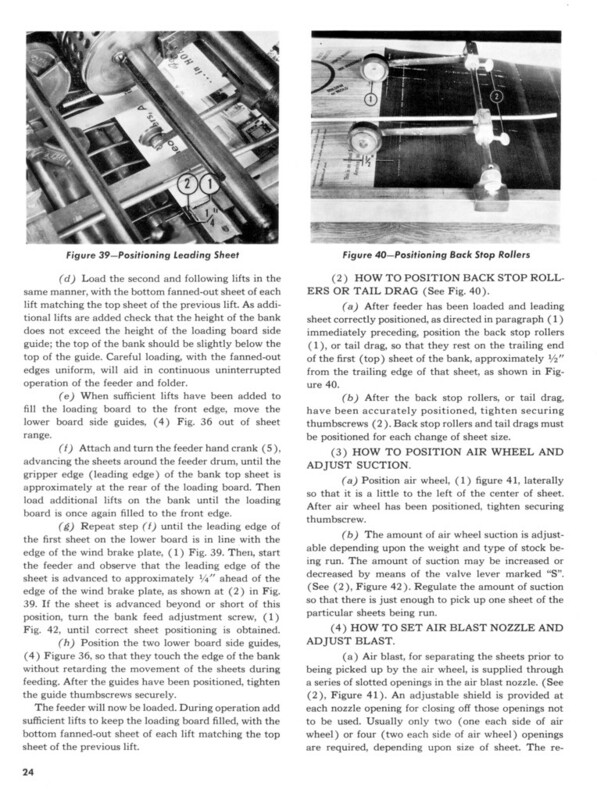 Need to know how to set a Cleveland ratchet feeder? I am listing this first as it's the earliest. 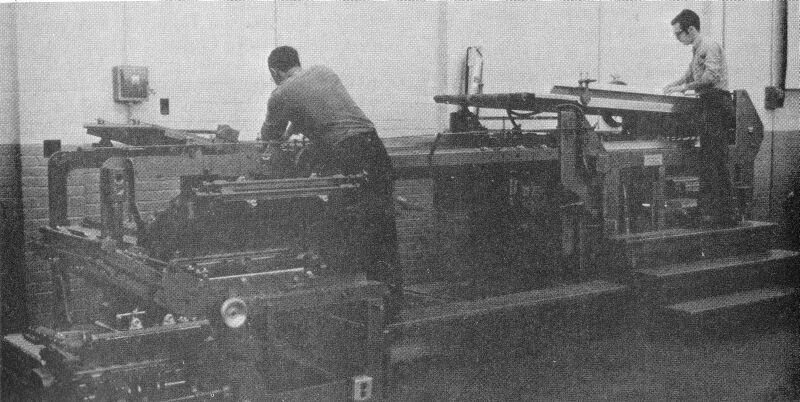 The William Marley bindery started in the 1860s. It merged with two other companies in 1970 and became Complete Books bindery headquartered in Philadelphia, Pa.
Warren Humphries has a whole photo album of photos of William Marley/ Complete Books bindery. (233 pics)- All the photos Warren worked there from 1960- 1982. Sam Bless & Co. Bindery, Phila. I took photos at the first Sam Bless Reunion and with the age of computers and digital cameras and scanners,etc... I finally got around to thinking I could throw them on a CD disc and give them out, but then thought I should do something one up and draw some floor plans and a list of people who worked there. The result was called the "Sam Bless project" and included a PDF file page about the company. The photos are from the first of two Sam Bless Reunion dinners. It was at a restaurant in Chinatown and held about 6 months after the company went out of business. The photo backs are dated as developed June 1984. This was held at the Packard Building on Broad Street and was free of charge as somebody footed the bill. It had many sentimental moments, such as someone announcing "It looks like we have the makings of a bindery right here." First Choice Bindery was at Third and Somerset Streets, Philadelphia, on the second floor of the building. The first floor was occupied by Die-Cut Specialty who owned both companies. After General Bindery had bought Sam Bless & Co. in December of 1983, most of the employees were offered jobs there. Many were dissatisfied, and some soon found an answer in First Choice Bindery. John Thomas and two partners had owned Die-Cut Specialty Co. for many years and then branched out to having a bindery, called First Choice Bindery, with Jimmy Heisler as its manager. 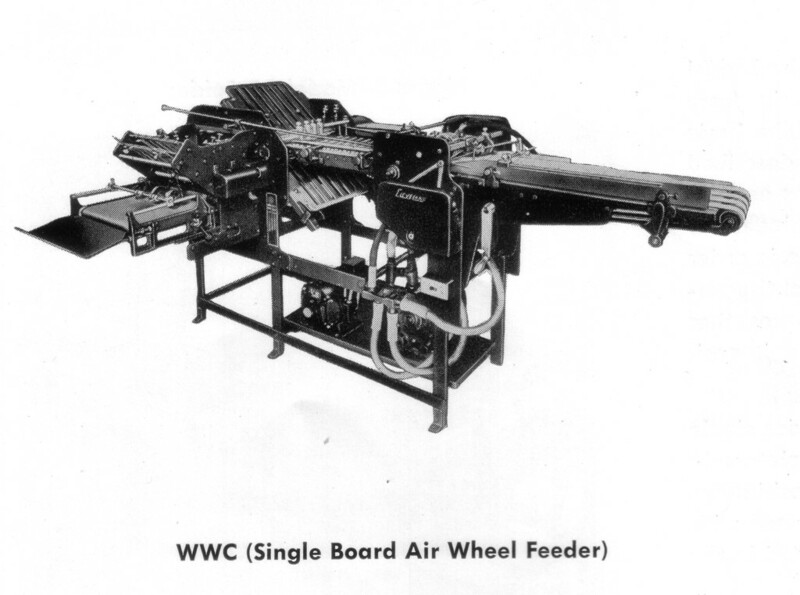 A lot of the initial machinery was purchased at General Bindery's auction of the Sam Bless equipment. The combined company of Die-Cut Specialty and First Choice Bindery was then relocated to 3rd and Somerset Streets, Philadelphia. 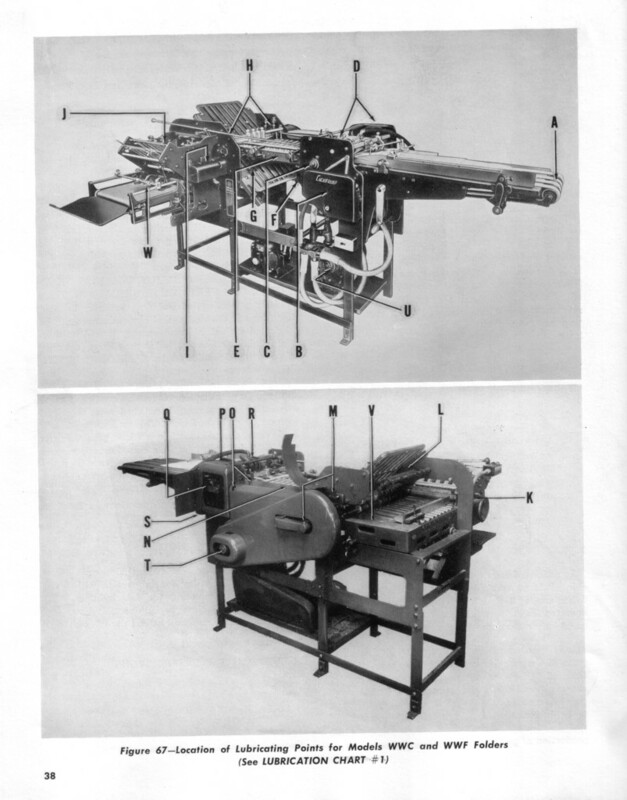 First Choice Bindery only lasted less then a decade due to financial problems. The shop did stitched books, always had about one folder doing miniature folding, regular brochures, and glued pads. There was a handwork section of local women at the front end of the floor of the bindery (Puerto Rican and other Spanish). These photos were taken in February of 1990 on a Saturday. I have written down Feb. 11, 1990 which might be the exact date. General Bindery was at 300 West Hunting Park Ave., Philadelphia, PA. Photos mostly taken by Warren Humphries. Warren worked at General and G & H from 1982 to May 2003. Photos I took while working at Star Bindery in Westville, NJ. 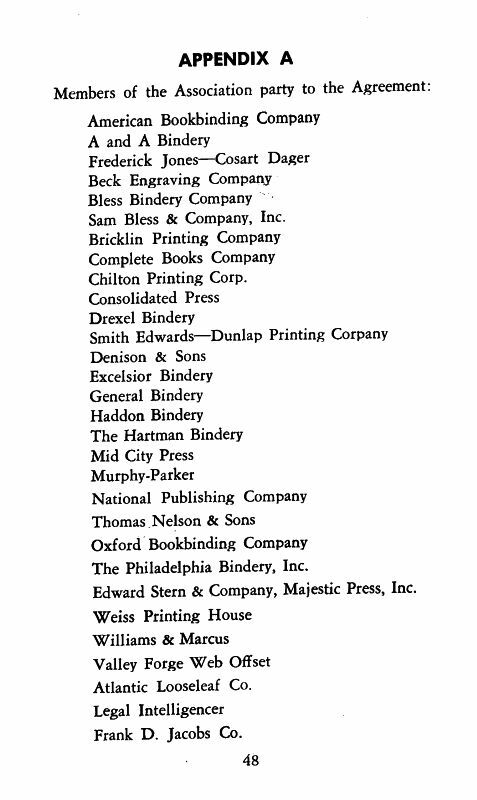 Bookbinders Union, Philadelphia 1971, Many of these were large companies. 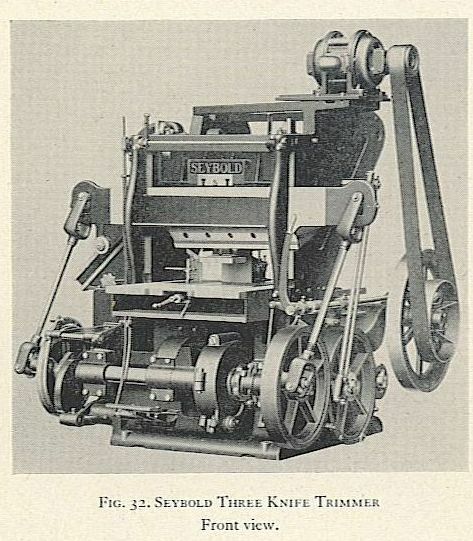 Seybold Three Knife Trimmer, which at Sam Bless we called "the Chopper." I would take out for the operator. You had to reach your hands under the knives!